I have wondered for some time: Why does an NFL football player kneeling during the anthem of the United States of America bother so many people? This week Nike has announced that Colin Kaepernick will be the focus of their next "Just Do It" ad campaign. Colin Kaepernick was the first NFL player to kneel during the playing of the national anthem in 2015, others have followed in his kneeling likeness. I can’t go on social media without reading someone’s anger about this ad campaign. Again I’m wondering: Why does this bother so many people? I personally could careless what an NFL player does because I do not watch football unless it is my local high school team. I am, however, on social media; so, I notice that every-time football season comes around there is much chatter about NFL players kneeling and threats not to watch, but the league continues to make their billions and the players their millions. Now there is much chatter and anger regarding Nike’s plan to use Kaepernick in their "Just Do It" ad campaign. Unlike NFL football I do have an interest in Nike because I wear there shoes and use their products when I go running and have done so for the past 45 years. This morning I logged a little over 6 miles in my Nike Air Zoom Pegasus 33’s, Nike running apparel and used the Nike Plus program on my Apple Watch to record my course, distance and pace. Given that I am an older runner (50) I must take care to avoid injury. I purchase a new pair of Nike Air Pegasus (my favorite running shoe) every 300 miles, for me thats about every 10 weeks; therefore, I spend a great deal of money on Nike products and have no plans to stop. The Nike Air Pegasus properly fits my foot and helps to protect my 50 year old joints from the impact of many miles logged each week on the road. I get that a statement like "Believe in something. 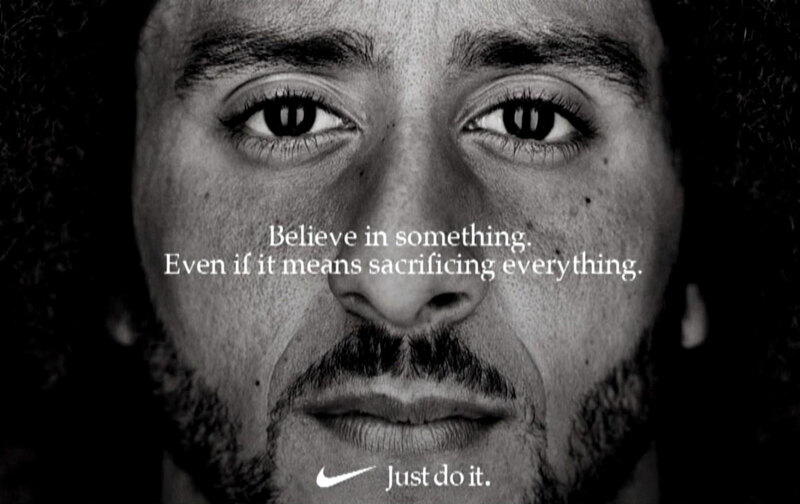 Even if it means sacrificing everything" is superfluous considering that you are receiving millions of dollars from the ad campaign. So, again I’m wondering: Why does this bother so many people? If this Nike ad Campaign bothers the citizens who are in the kingdom of man so be it. Jesus said that there would be wars and rumors of wars until the end. (Mt 24:6) However, if you are a citizen in the kingdom of God why be bothered by someone not stand during the anthem of the United States of America and why are you bothered by a business like Nike using a controversial figure in an ad campaign?